I like to use questions in my evangelism conversations with people. Questions help them think about matters of faith. Questions help draw people into conversations. Questions can help further a conversation along rather than me making declarations all the time. Evangelism Questions and the Engel Scale? I was looking at an article by Paul Hazelden about The Modified Engel Scale (Complete). The Engel Scale (use your favorite search engine to find more information) was developed several years ago to help map out evangelism as a process. The Engel Scale presupposes that conversion is a linear event, that conversion happens after a rational conclusion of examining the evidence that one needs a solution for sin and that Jesus is that solution. While it maps out evangelism as a process, the process is not as linear as it appears. For example, my own conversion was without any understanding of my sin — I just knew I needed to follow Jesus. I understood what sin meant when I began reading the Bible later. 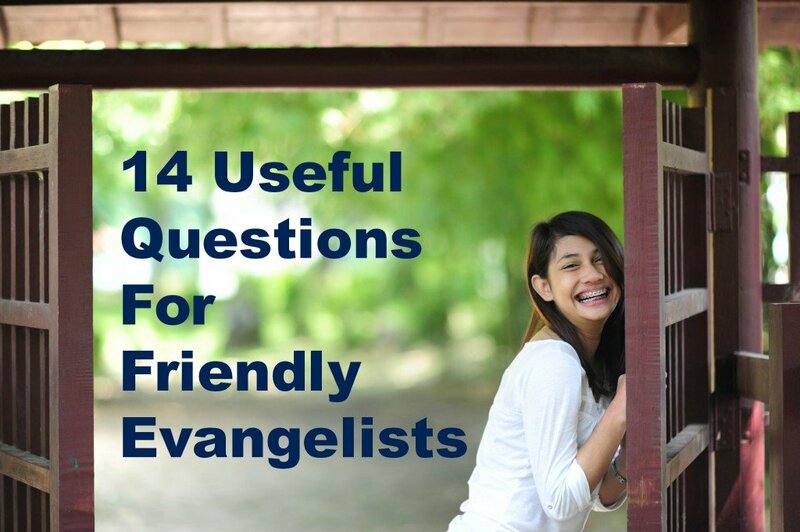 14 Questions an Evangelist can use. At the end of the article, there is a list of questions that can be helpful to the evangelist. I refer you to the article for the larger context. The Modified Engel Scale (Complete). These are some possible questions to help determine where a person is on the revised scale in their journey towards Christ. Is it possible there is a God? Do you believe God may exist? Are you certain there is no God? Is there a purpose to the universe? Does the human race have a destiny to fulfill? Do you think you may be mistaken about whether God exists? Is it possible you may be mistaken in your ideas about God? Do you think there probably is a God? Do you think God is a person? Do you think God gets angry about some things? Do you think God created the universe? Do you think a person can know God? Do you hope it may be possible to get to know God? Do you believe anyone in the past has known God? What questions do you like to use in your conversations? Great questions. If I have had the chance to get to know someone well enough I’ll just ask, “Where do you stand with God?” I’ve noticed that the question usually goes over pretty well. Some may hem and haw at first but it usually gets people talking. What are some typical responses that you get? I get a variety of responses. A lot of people’s first response is laughter and then they might say that they don’t know where they stand, or they might say that they try to be a good person and they hope God sees that. Some people will say that they have strayed away from God. If someone says that they hope their standing with God is o.k. based upon being a good person, then I can share with them about how all have sinned and that good works can’t earn salvation. If someone says that they have strayed away from God, I try to find out what they mean by that and then talk about what true salvation means. Many times I use myself as an example because it takes away the defensiveness that the conversation can create. After talking about myself it is easier to refer to the other person. Hi, I found this method much effective than telling people right away about the gospel. Asking questions and listen very carefully of what his response is to the question is important. I have a ministry called Question-based evangelism that I am presently using in my ministry. Questions allow us to engage people in a real discussion. Keeps conversations feeling safe and allow us to listen for the real spiritual point of need. I generally ask what if they believe in heaven and hell and what they believe it takes for a person to get to heaven and what causes a person to go to hell. My response is then, Would you mind if I show you how the Bible answers this? This takes the focus off of “My” thoughts and puts it on God. Sorry, that was “if they believe” not what if they believe.! On the one hand, you are right. Open questions lead to further dialog. But I have found that in a respect-filled conversation that has a history of friendliness, these closed questions function ok, as many people continue with an explanation of their yes or no in the give or take of dialog. Context helps. I would agree with you that using these “cold turkey” to open a conversation may not be as effective as an open question. Where your conversation partner is defensive, they won’t be useful either.